Good sports shoes are not just important; they are essential for any sportsperson. They can help you bridge the gap with your competitor and even outwit them. If you are playing badminton, you need proper shoes too. In fact, the importance of best badminton shoes can never be overemphasized in an intense game of badminton. Shoes are so important for a badminton player that they can make or break a game. You can compete in a tough game of badminton only if you have good badminton shoes. You need good shoes for almost every maneuver you make in the court. You need to be nimble-footed so as to quickly move from one corner of the court to another. You also need to spring up suddenly and deliver a smashing hit. At almost every point in a game of badminton, you would feel the need for good shoes. Here you can go through some of the shoes that can help you achieve excellence in every aspect of the game. Do I need to buy a pair that is strictly designed for badminton? 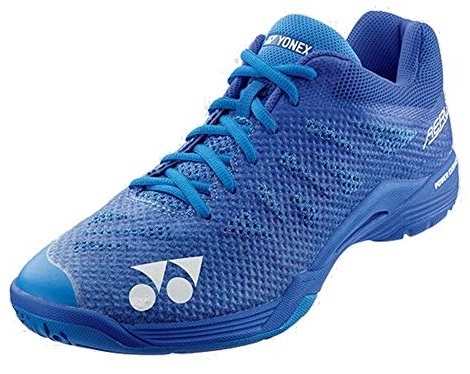 How should I know that the pair I am buying is one of the best badminton shoes for its price? How should I clean my shoes? Can I use my badminton shoes as every day wear? 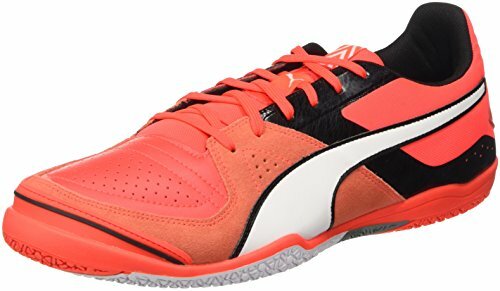 This pair of indoor shoes is from the house of Puma which is known for designing one of the most sought after sports shoes. They don’t just design; they develop new niches of sports shoes. It is a versatile shoe for indoor games. The outsole is made of non-marking rubber which offers necessary grip to the badminton player in any conceivable posture. Owing to this, the player can play at ease on any court, make quick maneuvers and go for the right shot at the right moment. The upper portion is a mixture of comfort, durability, and breathability, and is made of polyurethane and EVA mesh. Apart from its usability and durability, this pair of shoes comes with a warranty against manufacturing defect. Sports shoes have to be easy to fit in order to be comfortable. The Tenaz Indoor Unisex Teamsport Shoes is one of those sports shoes that are available in a variety of widths. So one can try different widths and decide on the easiest fit for him. This sturdy and attractive shoe that enables the player to take his gameplay to the next level can be somewhat costly to acquire, but it is surely worth the money. Nevertheless, it does not cost heaven. Polyurethane and EVA mesh upper for excellent comfort, breathability, and durability. Yonex has been designing excellent sports shoes especially for tennis, golf, and badminton. The Yonex SHB imparts a soft cushioning effect to the wearer. It also has a power cushion effect due to the presence of MX Power Cushion support. The combination of SC5 and MX offers one of the best shock absorption capabilities in this Yonex shoe. What is more, if the player is suffering from a knee injury and would like a shoe that offers some respite to the knees from the torments of an intense game, this can be a very good option. 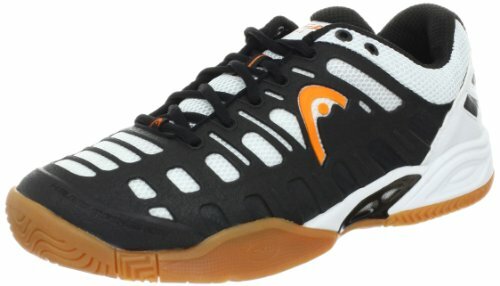 Carbon Graphite Sheet in this shoe offers a high degree of stability, which is the hallmark of any good badminton shoe. The trendy Navy pattern imparts a manly hue to the shoe. Since the shoe is available in a variety of sizes and widths, one can always get one that best suits his or her feet. It is indeed a costly buy. Nevertheless, its highly comfortable grasp and the respite that it offers to the knees make it a worthy buy. You would never regret buying this pair of shoes. Babolat is a world-renowned French company known for designing perfect shoes for indoor games like badminton, tennis etc. This particular shoe from Babolat has a rubber outsole. Rubber is great for stability, wear resistance, waterproof and bendability. While being waterproof does not matter in any indoor game, all the other characteristics make it a perfect outsole for badminton shoes. Rubber also makes it comfortable to wear. Nevertheless, what really sets it apart as a class of its own is its Active sculpture technology. This technology offers excellent shock absorption capability and optimal adherence to the ground. Explosive movements and sudden stops characterize an intense game of badminton. This technology along with the rubber outsole helps with such movements and sudden actions while maintaining stability. In essence, this shoe can help the player realize his true potential. You can get it in various widths and sizes. To getting the perfect fit is not a problem. It may be one of the most appropriate badminton shoes, but it is expensive. However, the ensemble of material and technology makes it an excellent buy for any aspiring badminton player, though it is costly. ASICS is a world-renowned Japanese company which specializes in sports equipment and shoes. 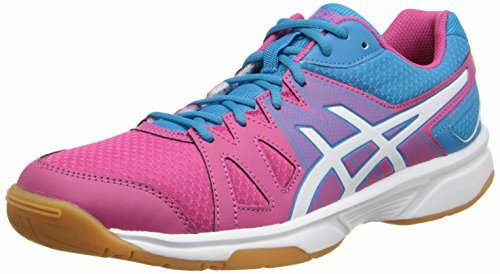 These shoes provide the support and cushion that a badminton player, especially women, need for jumping, pivoting, sudden sprint etc. 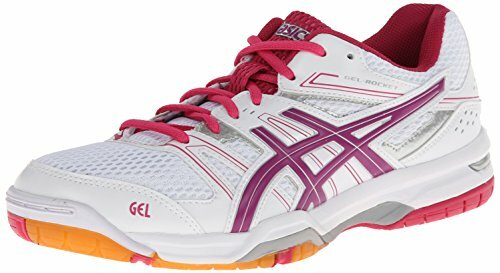 The proprietary GEL® Cushioning System of Asics makes it highly comfortable. It also does not hurt the bunions, which some shoes are notorious for. The combination of synthetic leather and mesh in the upper and Gum Rubber outsole makes it highly flexible, breathable and comfortable. They offer excellent traction as well as stability owing to the rubber outsole and propriety technology. The gum rubber outsole offers great traction as well as stability. One can get them in normal width and medium arch that goes well with women’s features. The best part of these shoes may well be its price. Despite all its qualities, it comes for a modest price. In fact, the value proposition of buying a pair of these shoes may far outweigh its price. This an entry-level all-around indoor game shoe for men from the house of ASICS. The tough mesh upper, durable outsole and forefoot GEL cushioning system helps in absorbing much of the shock arising out of impacts during an intense game of badminton. It has a lace up style. You can also get a warranty against manufacturing defects within 90 days. The outsole and the cushioning system offers good stability. One can get them in various widths which mean that it should fit snuggly with the width and arch of your feet. To maintain its stability and fit, one needs to clean it with a clean cloth, but not use any polish or shiner. All these qualities come for a price. However, for any budding badminton player, this can be one of the best shoes to start with. To that effect, it does not command an exorbitant price. Yonex is a Japanese multinational that specializes in manufacturing equipment and shoes for indoor games like badminton, tennis etc. Power cushion is a proprietary feature of Yonex shoes which makes some of the best badminton shoes. The Yonex Power Cushion Eclipsion 2 shoe has a midsole of Ethylene-vinyl acetate which offers super cushioning effect. Owing to the Power Cushion technology and EVA midsole, the shoe not only absorbs much of the shocks from impacts but also reverses the impact energy. This helps in smooth and rapid transfer of energy to the next movement, which augurs very well in an intense game of badminton. Such exclusive cushioning effect makes it highly comfortable. In fact, the combination of power cushion and EVA sole is so effective that an egg dropped on the sole from a height of 7m can bounce back about 4m and without any damage. The combination of PU, leather, and polyester mesh upper makes it comfortable, breathable and flexible too. The outsole of rubber and midsole of EVA offers excellent stability, grip, and flexibility. One can get these shoes in a variety of widths. So fitness of the shoe should not be a problem. Despite its commendable cushioning effect and energy transfer system, it does not cost the heaven to procure one. However, it is mostly for advanced users. Yonex has specialized in badminton and tennis shoes and equipment. For those who are looking for the top-notch badminton shoes, this one from Yonex can be a dream come true. It boasts of the typical Yonex three-piece power cushion system for forefeet, heel and full length. Along with a midsole of Elastic Ethylene-vinyl acetate, the three-layer power cushion system offers unmatched shock absorption and energy transfer capability. This makes it one of the most comfortable and bouncy shoes. A combination of PU leather upper, ultra-fine Double Russel Mesh and ultra-light Kuraster insole makes it highly flexible, stretchable, comfortable, light and breathable shoe. Power Graphite Lite placed in the shoe enhances stability and reduces the weight of the body on landing. The combination of power graphite, EVA and thermoplastic polyurethane midsole offers unmatched stability. The rubber outsole aids in stability, stretching, and flexibility. It is costly and there is no doubt about it. Nevertheless, it offers unmatched quality. You may go for it if you are in highly competitive badminton. However, nothing restricts you from wearing this even if you are just a new entrant. Yonex SHB-SC5 is one of the best badminton shoes. This badminton shoe from Yonex comes with 2mm thicker Power Cushion at full length in comparison to earlier versions. This is a super light shoe that offers super grip and is super comfortable. Take a swift leap, land on your toes, pivot around the toes or break into a short burst of sprint – this shoe can help you do all. Three-layer power cushions with 2-mm thicker midsole offer excellent cushioning and comfort. The thicker layer also reduces stress on the knees. It has a highly stable and agile design owing to the hexagrip sole and grippy gum rubber outsole. The shoe is also available in various widths so that it can snuggly fit almost any fit. It is an expensive shoe. Nevertheless, its merits seem to outweigh its cost by a large extent. For an intense battle in the court, this can be the shoe for an achiever. This shoe incorporates the proprietary three-layer power cushion system from Yonex that makes one of the best badminton shoes. 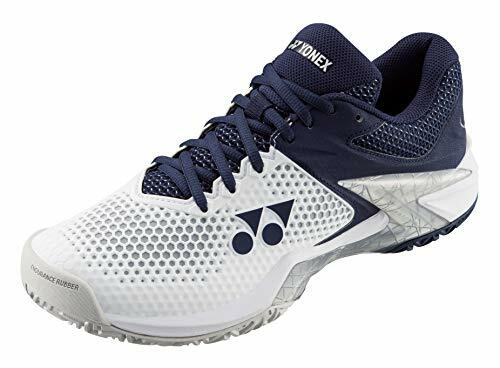 While this system offers the exclusive Yonex comfort and cushioning effect, the upper material of PU leather, Double Russel Mesh, and Tough Guard III offers excellent stretchability, breathability, durability, comfort, and strength. The Tough Guard technology also offers resistance against heat which offers prolonged comfort and helps with better performance in an intense battle in the court. The midsole of ToughBrid Light offer unmatched elasticity, cushioning, and shape retention capability with a reduced weight. The Power Cushion system, solid E.V.A., and Power Graphite Sheet offers excellent stability on landing and prevents knee injury. The rubber outsole also helps with flexibility, pivoting and stability. What sets this shoe apart is its wider fit. It is best for those with wide feet. It offers them better stability on landing and helps with quicker and sharper maneuvers. This is an expensive shoe. However, its value proposition far outweighs its price. 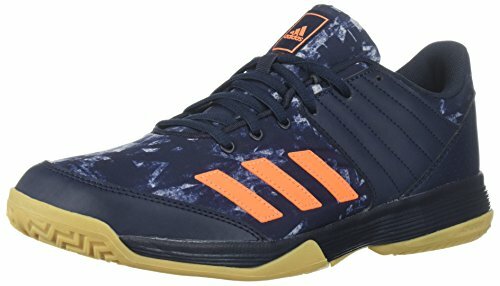 Adidas is known for designing some of the best badminton shoes which are exclusive in their class. 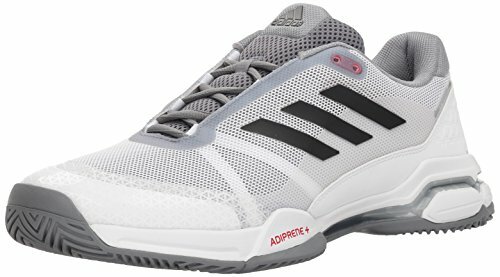 This badminton shoe from Adidas can be a very good one for any aspiring badminton player. It is comfortable and offers enough cushioning so that the player does not end up with aching feet and toes. The synthetic rubber insole is very soft and comfortable and the surrounding material fits snuggly and fills grippy, but quite comfortable. Synthetic overlays on the sole offer strategic support to the feet. The air mesh upper lining offers enough breathability and ventilation and the player is not likely to suffer from sweaty feet and bad odor even after long hours of an intense game. You don’t need to worry about removing the odor from the shoe. It is made of 100% synthetic material. ADIWEAR outsole is a proprietary technology of Adidas for shoe soles. It offers an extremely durable non-marking rubber outsole for shoes primarily used in high abrasion events such as tennis and badminton. The sole offers an optimal balance of excellent traction, abrasion resistance, and flexibility. Badminton players need to do a lot of sudden take-offs and landings which put pressure on the heels and toes. ADIWEAR technology from Adidas reduces the wear on the heels and the toe areas. It also offers durability to the shoes while letting the player pivot and slid easily and fell comfortable all the way. This technology in combination with high wear durability, non-marking rubber outsoles render these shoes highly stable in every posture. As far as fitness is concerned, this one is made primarily for men with large feet width. This implies that people with large feet width would find it really comfortable. However, those with narrow feet width would also feel the shoe snuggly and comfortably fitting their fit. Anything that is good comes for a price. The Adidas Performance Men’s Ligra 5 shoe also comes for a price. 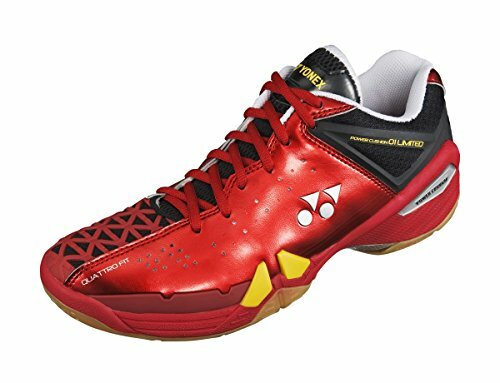 However, for men, this can be very good badminton as well as volleyball shoe. This lightweight pair of men’s shoes abates aggression at the net that is so important for badminton players. You can walk nimbly footed always ready to attack the net. The shoe boasts of an excellent Torsion System in the midfoot that is supportive of every lunge and patented material at the heels. These two combined can give you the required energy and stability that you need to make repeated attacks on the opponent. The shoe is made of 100% textile and rubber sole. It has arch Removable insole. Being 100% textile, these shoes are highly breathable. So you can bid goodbye to sweaty feet and feet odor. There is ample airflow which abates comfort. The cushioning inside is excellent. The proprietary ADIPRENE technology offers extra cushioning under the heels. However, the cushioning is not only on the heels but also on the forefeet. This implies that the shoe abates attack to leap on your forefeet and landing on your heels. That makes it quite an impressive shoe for repeated attacks. Its comfort and cushioning in combination with attacking design makes it a breeze for budding badminton players. Though it feels somewhat strange when worn for the first time, it is really a comfortable fit after you wear it for some time. The proprietary sole in forefeet, heels, and midsole makes sure that you are stable in every posture whether lifting on the toes, landing on the heels or taking the attack to the nets. 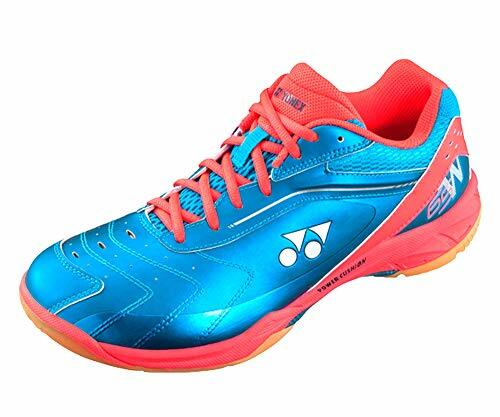 It is a costly buy, but it is not so costly as some of the other best badminton shoes. For a budding player who likes to be aggressive, this can be a very good choice. 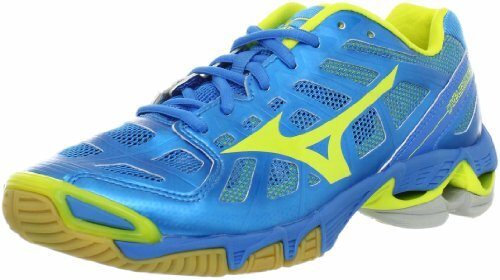 Mizuno is a Japanese multinational company which specializes in designing some of the best badminton shoes. It not only designs, but excels in designing indoor sports shoes. This particular pair of shoes is meant for beginners. Mizuno shoes are reputed for being comfortable and available in a wide range of styles. This Mizuno pair of shoes boasts of three seamless layers of upper. The low profile Compression Molded EVA midsole offer good cushioning effect. The combination of synthetic upper and Air Mesh technology offers excellent breathability, support, and comfort. The air mesh material offers excellent ventilation too so that the player can keep her feet dry and comfortable throughout the game. It is also helpful in preventing the formation of blisters and Athlete’s Feet. Dynamotion Grove and Power technology in this pair of shoes help in shock absorption and keep the player safe. It also offers some extra cushioning effect, which also offers added support and stability in any posture during an intense game of badminton. Since the shoe is available in a number of styles, there is not likely to be any problem with fitness. It also has a non-marking sole made of extra grade rubber which offers good grip and stability on the court during attacks or quick maneuvers. Moreover, Dura Shield technology offers excellent traction. This makes sure that the player is not made to drag her feet on the floor during quick maneuvers. It is a costly buy by most standards. However, this is a type of shoe that one can use in any kind of indoor sports as well as for training purpose. That makes its value far outweigh its cost. Yonex has been designing some of the best badminton shoes and this limited edition shoe is one of them. This pair of shoes is a display of confidence bestowed on Yonex by top badminton players of the world such as Lee Chong Wei. It incorporates the most advanced formula that ensures absolute comfort, stability, and protection for your feet. The upper part of P.U. Leather, durable skin and Double Russel Mesh makes it durable, flexible and breathable. This renders the shoe comfortable and odorless. The midsole incorporateToughBrid Light and Power Cushion technologies. Power cushion technology is Yonex proprietary technology. It consists of three-layer cushioning for forefoot, heels and full length. The ToughBrid Light sole offers unmatched cushioning elasticity, and shape retention while at the same time reduces the weight of the sole. Since the soles of a shoe contribute significantly towards its weight, the weight of this pair of shoes is less compared to some others. It helps during sudden take-offs, landings as well as maneuvers. The thermoplastic polyurethane sole along with Power Graphite Sheet ensures that the player derives exceptional stability in every position on the court. It boasts of rubber outsole which makes it flexible, grippy and controllable. It comes fitted with Quattro Fit – Shaped Shoe technology. This is Yonex proprietary technology which ensures that the player gets perfect fit at every place of significance, i.e. smaller toes, arch, heel, and mid-foot. The design makes sure that the excess space left by the smaller toes at the front of the shoe is reduced. This improves grip and power transfer during sudden stops or accelerations. It also boasts of a re-shaped heel and mid-foot area to ensure quick response and nimble footwork. The heel area has a round sole which ensures smooth movement and maximum transfer of energy. The dark pink color seems to hide the aggression under a hue of composure. There can be no argument about the value proposition of this limited edition badminton shoe. However, it is quite costly. Puma, the manufacturer of some of the best badminton shoes, has come up with this spectacular shoe. It is designed to fit not only your sport but also your lifestyle. 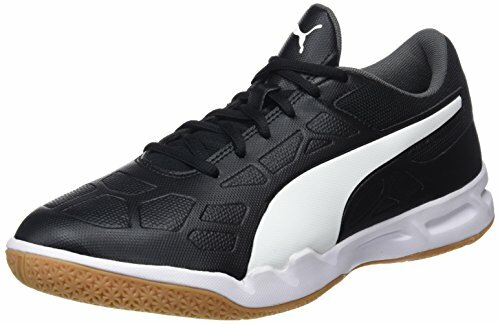 It brings with it a mixture of fabulous proprietary design and technical brilliance to offer unmatched agility, traction, stability, comfort, and maneuverability in the court and also double up as a casual shoe. It is also one of the most reasonably priced indoor sports shoes available in the market. It boasts of natural suede leather seamlessly merged with mesh inserts for excellent breathability. It will feel like your feet are being hugged by the shoe. You will also feel dry and cool throughout even in an intense game that is dragging on. It boasts of rubber toe reinforcement design which ensures that the toes get the best level of protection during an intense game. You may well be aware of the torturous treatment that the toes need to undergo during an intense game. All those sudden life offs and landings on toes make them virtually the pivot of a good game. This pair of shoes has a sock liner that not only offers cushioning but is also lightweight. While the cushion offers comfort and support to the toes, the low profile midsole offers superb control. The outsole of non-marking rubber is not just lightweight but also offers great stability. The rubber toe enforcement offers exceptional stability in every position and easy maneuverability without every compromising with stability. It also offers great traction; so you can undertake sudden sprints without losing stability and grip on the court surface, whether it is indoor or outdoor. The outsole is low profile which offers excellent ground touch and control. It has a lace up style which offers a secure fit. It is available in a number of colors. Since the design mostly suits those with wide mid foot, it offers a very stable and secure grip. It is one of the best indoor shoes that are somewhat affordable though costly. However, while buying a pair you need to consider its valuable contribution to indoor games. Head UK Ltd. is a leading manufacturer of premium sports shoes and equipment. This is a durable and middleweight shoe that scores high marks almost on every count of a good badminton shoe. It is one of the best badminton shoes around. The Head Speed Pro Lite shoes offer plenty of cushioning, comfort and style. Once you settle in the shoe, it will fit snugly to the shape of your feet and offer adequate cushioning effect. However, you need to give it some time to settle in. You can completely eliminate the pressure points after a few games. It boasts of gum rubber sole which offers excellent grip in any position. It incorporates Head’s proprietary Lateral Control technology which offers excellent stability with the help of a flared sole in the forefoot that restricts rollovers. Extensive use of mesh panels on the upper offers adequate ventilation even in a protracted game or sultry environment. In fact, there are mesh panels even on the tongue. The outsole has a flex zone which is very helpful for natural flexion of feet and to ensure a snug fit for your feet. It ensures that the player doesn’t lose steps. It ensures that the player can make quick maneuvers whenever required. As far as style is concerned, these shoes are great. Lateral Support technology and flared outsole offer rock solid stability and confidence in every maneuver in the court. The shoe boasts of deep and aggressive tread which help with quick maneuvers on any type of court. In a scenario where you need to hit a powerful smash immediately after take-off and then move quickly to the next location and attempt the next shot, there is a risk of slippage. This shoe will prevent such incidents. It boasts of a combination of stability, comfort, and traction. It is costly, but not as costly as some of the other niche badminton shoes. In fact, its value proposition seems to outweigh its cost. If you are a sports buff and want to make a mark in the badminton court, you need to be fastidious about selecting the best badminton shoes. Even if you are not a pro, you need to be fastidious about its characteristics. You need to look for durable and stretchable material, comfort features, stability, cushioning and extra features, if any. It requires comprehensive research. Before buying a shoe it is a good idea to go through a few reviews. Size is very important, since individual shoemakers may have individual scales. So one-size-fits-all criteria may not augur well for you. Whichever brand or model you settle for you need to go through different sizes of it to select the best fit. However, there are some shoes which appear to be clumsy and tight in the beginning. This does not mean that the size is not fit for you. This is the characteristic of many sports shoes. You need to give it some time so that your feet can settle into it. Try different sizes from different brands and settle for one that appears to be most comfortable and stable. This is one of the most important criteria for selecting a pair of good badminton shoes. 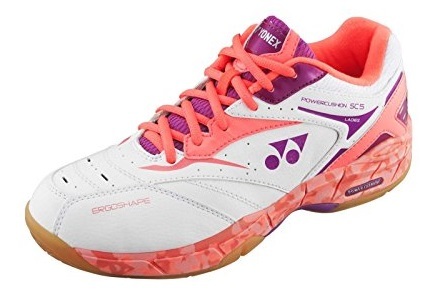 The best badminton shoes are made of such a combination of material that it makes the shoes lightweight, breathable, stable in all position, tractable, comfortable and cushioned. The shoe must have adequate mesh in the upper. Having some fine mesh in the tongue enhances the ventilation capacity of the shoe. Having adequate mesh helps with ventilation and offers comfort in long drawn games and sultry weather. Along with being breathable, the shoe also needs to be insulated to prevent heat and cold disturbing the comfortable wrap around your feet. Nevertheless, there needs to be an element of leather too. Leather not only imparts good looks but also makes shoes durable and stretchable to some extent. The feel of the leather is comfortable too. A feeling of comfort and dryness is very important in an intense game. So a mixture of leather and mesh for upper is good for the feet. The sole is very important for any sports shoe. The sole should be made of such material that it offers great stability and an ability to leap up, land and move on to the next shot smoothly. An outsole of gummy rubber can offer good grip in any posture. However, there are some other materials too that offer excellent grip. There are some brands which come with the proprietary cushioning system. Even if there is no such system, you need to see that the shoe has a good cushion. Nevertheless, it should not make the shoe heavy. Toes have to bear a lot of torturous treatment during a protracted battle at the nets. Some of the best badminton shoes come with toe and heel reinforcement technology. Reinforcement may come in the form of specialized soles for toe and heel. There are shoes that come with a triple layer of soles which offer stability, comfort, protection as well as traction. Sports shoed undergo a lot of tortuous moments during intense and protracted games. The material, design, and finish should be such that it makes the shoes durable. There are some shoes which are resistant to oil, water, etc. All these qualities make the shoes more durable than some others. 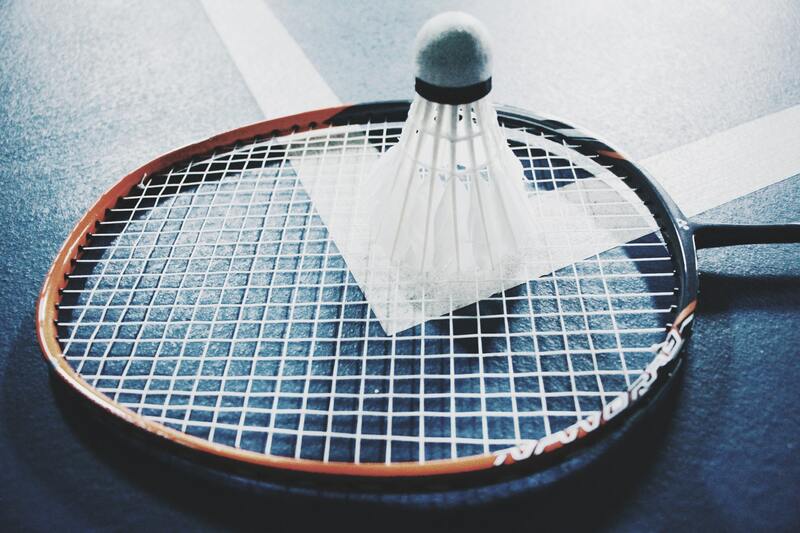 It is possible to buy a pair of good badminton at an affordable price. However, being stingy may not augur well for your feet and gameplay. So go for a shoe that is suitable for your type and level of play and concentrate on the niche characteristics for that. This may help you come up with an affordable pair. It is a good idea to go for a pair that is specifically designed for badminton, but only if you are a pro. If you are a budding player you can do very well with any indoor sports shoe. Shoes that are specifically designed for badminton do offer some extra in terms of playing badminton. However, this does not mean that shoed meant for volleyball or squash don’t work in a badminton court. The principal criteria of cushioning, traction, and comfort are almost same for all indoor games. When selecting from a huge selection of badminton shoes, it may become difficult to choose the right one. As you go on including more and more criteria, the price also goes on increasing. So you need to stick to the basics. Look for fine mesh in the upper to ensure that the pair offers optimum ventilation. Since a good outsole is essential you need to see if the pair sports gum rubber outsoles or not. Gum rubber soles are good for stability and grip. You also need to see if the cushioning system is optimum. For this, you can try out a few pairs and also ask the store people. Also going through the reviews of some of the selected models can give you a fair idea about the best one for your budget. You need to clean your shoes frequently since that will help with a good grip. Use some warm water, brush, soap, and a towel along with a pointed object. Use the pointed object to remove dirt, stone chips or debris sticking to the grooves of the sole. These objects drag down the grip and traction of the shoe. Now, make a solution of soap in warm water and scrub the sole with the brush. However, don’t use too much water especially on the upper. After you have cleaned it completely, you need to wipe the shoe with the towel. Keep it in a clean and dry area and let some natural airplay through it. After that keep it in a clean bag for use in your next game. The best badminton shoes are designed for indoor use. So if you wear them outside you may damage them. The outsoles of these shoes are not effective against tar roads. Moreover, the shoe may lose its grip if you walk on the tar road often wearing these shoes. However, if you are wearing them indoors, they are not likely to get damaged.